Let's face it, life on a farm while often idyllic is messy. There's mud, dirt and dust, chicken and horse manure. I am in and out of the house all day long and most times my hands are dirty when I come in the house. And much as we love our furry and feathered friends, the reality is that germs and disease can be easily transmitted from them through poor hygiene, so I am always washing my hands. 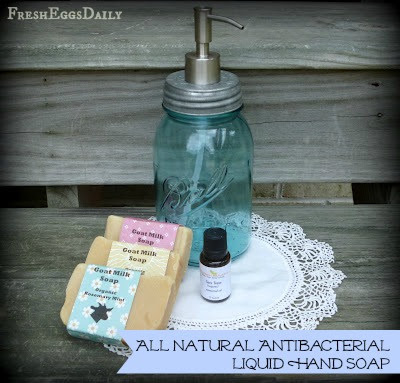 I love the idea of anti-bacterial soaps but worry about the commercial soaps because of the health warnings, so I decided to try making my own anti-bacterial hand soap. It turned out to be far easier than I imagined. I used tea tree oil, lavender and citrus essential oils, which all have anti-bacterial and anti-fungal properties, as well as some Vitamin E for soft skin. 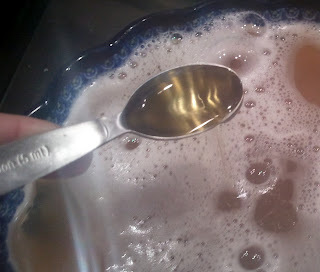 Grate the bar of soap into a small saucepan filled with the 4 Cups water and heat to boiling. 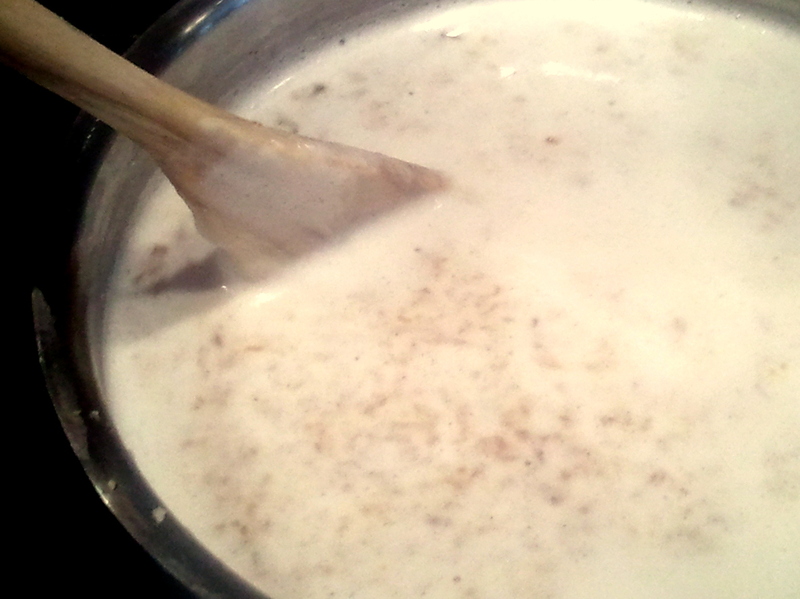 Let boil for several minutes, stirring to ensure all the soap is melted, then remove from heat. Add the glycerin and oils, stir to mix and let cool. Pour into a glass dispenser and let sit overnight. In the morning, the soap will have turned to gel. How cool is that? 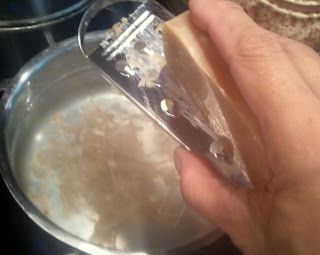 If you find that it starts to solidify after awhile, just unscrew the top and whisk up the soap with a kitchen whisk and you'll be good to go. Our source for organic essential oils. I've been a fan on facebook for awhile now. I love your posts. I am def going to make this hand soap. I think I'll make it for my girls for Christmas too. I wasn't planning on going anywhere today, but I'm going out for a couple essential oils and a bar of goats milk soap. This looks so easy. Thanks for posting the recipe and for the chance to win the ingredients. Love the soap, I wash my hands so much, like you I'am in and out all day, between the chickens, ducks, turkeys, and all the goats....my hands take a beating, I have already had to go see the doctor about them, because they stay so dry, but I'am going to give your recipe a try, and see how different it is from store bought, it sounds like its very soothing to your hands...thanks. I'm going to try this recipe..Looks really easy. My goal as I phase out of full-time work is to become a soap maker. I've been collecting some books but haven't tried any of the recipes yet. My head is bursting with ideas of what I want to do. Now just need to find the time and space for my workshop. Great giveaway! I follow you by email and have liked you on Facebook for a while now! Love this recipe. Oh I made the laundry detergent and I LOVE it! Oh good! I love the laundry detergent also. I've got my fingers crossed on this one! Love that you are trying all these great home made ideas. Not sure how to link this to others but I forwarded your page address to all my email buddies and I am on your facebook likes - have to be I read your page everyday! :D We have a small flock of chickens too and my uncle taught me a lot from his as I was growing up. Chickens are peaceful and so calm. My husband has uncontrolled seizures and he works (plays) with our chickens daily. Has them all named and all. I enjoy reading and telling him about your stories on this page - thank you so much for that only. I love this contest! Nice to make your acquaintance. We share many interests. I look forward to following your blog. OOOOhhhh - I found you a week ago or so and liked you on FB! Above I meant to say "Thank you for that if that's was the only thing you offered - your stories". Dumb me! Sorry! This is a great blog post!!! I LOVE jars for anything and everything and am tickled pink to see this recipe! Now - if I don't win....I'll be sure to get those ingredients and make my own! Always something interesting at Fresh Eggs Daily. I lookforward to reading your posts. I love following all the ideas on your Blog :) Always interesting and useful. I love the creative ways of doing things. Fresh Eggs Daily is definately one of my favorites! Having trouble with entering the contest but I want to win! Email is Betty@JustCallBetty,com , I have already liked you on Facebook. Love your Facebook page and your blog! Always great info! I have just recently discovered FED and I LOVE IT! Thanks for coming up with an activity my Granddaughter & I can share ... I was running out of ideas. I remember when my Mother & I made soap because I was going through a 'I allergic to everything' stage. You have a fun site. Love your site but today I couldn't open the giveaway check off box. I hope there won't be a problem. I love your blog and have tried all the neat homemade things that I can. Sure going to use this receipe! I love all the contests yall hold!! way to keep your Blog interesting!!! Keep up the good workd and I hope to win something one day!!! I follow the blog by email and on Facebook. I will definitely be trying this recipe ! Thank you for all the great info. I'm a fan of Fresh Eggs Daily on FB and the blog.......count me in please!! This is such a great idea and gift idea. I'm a big fan on FaceBook. Check, check, check! lol Love your blog and always read your FB page. Thank you for the instructions. I will be trying this soon! What a great giveaway! Been a follower of both for awhile now! I can't wait to try making this! Any ideas on how to make the stuff you rub on your hands to disinfect. I just bought a few bottles to keep in my shed by my coop, carry when walking my dogs, and carry in my car when I visit my horse. I'd love to find a way to make my own. Oh, how neat!! I love the idea. Thank you for sharing at Sharing Saturday!! What a great idea - made even better by the tutorial! I love the ideas I can do in my very own home. Thank you for this and for linking up via NOBH. Smiles! Sure I would think so as long as it melts. Great post. 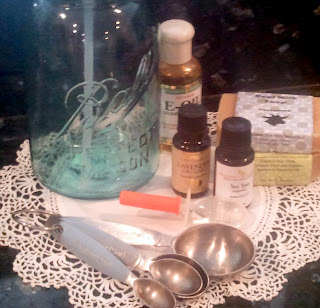 This week over on Wildcrafting Wednesdays we’re hosting a special Hygiene Edition and this post would be perfect in the carnival. I’d love it if you would pop over and share this post again with our readers.